Summer is coming very fast again and I think there are never enough pineapple tops. I made pattern for a very nice Summer pineapple square top. For this top, size M, with sleeves (you can make it sleeveless as well) I used 400g of soft baby acrylic yarn suitable for G/4mm hook. The choice of the material is up to you. I suggest you make one square, check the size, use smaller or bigger hook to achieve cca 12 x 12cm (4,8’’ x 4,8’’) square. You can make the top smaller or bigger by using different size of the hook. The tops back and front are crocheted by joining flower motives. 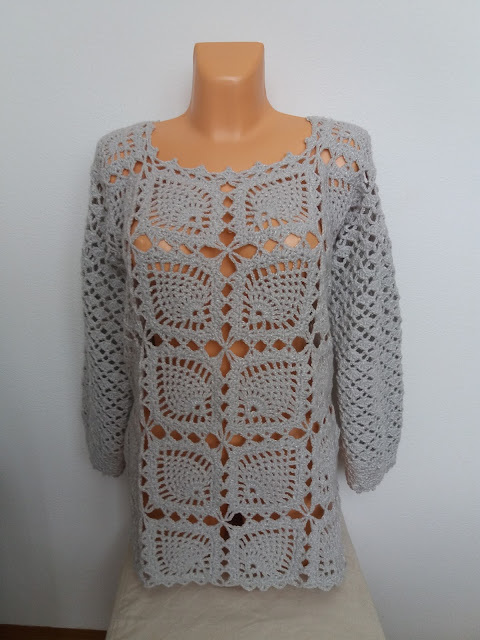 The sleeves are crocheted in rounds. There are many pictures and few charts to help guide you through the crocheting, and supporting the written pattern. I do believe this pattern is suitable for a dedicated beginner as well. Today I would like to share with you a pattern for beautiful pineapple earrings. Although I love to, I’m not usually wearing longer earrings. With these earrings I did make an exception. I made them in three colors and I’m wearing them as well. They are very easy and fast to make – a one evening project. The size of the earring is dependent very much on the size of the hook and the material you will be using. I worked with Aunt Lydia’s Classic Crochet (size 10) cotton, but any material which suites your purpose is just fine. I added a few beads to make the earrings look even more interesting, but the beads are optional. There are pictures to help guide you through the crocheting, and supporting the written pattern for these earrings. I’m also confident that this written pattern is suitable for a dedicated beginner as well.